This post is sponsored by Stubb’s Legendary Bar-B-Q Sauces and Rubs. I don’t know about you, but when our family gathers for the holidays, there’s usually between fifteen and twenty people — plus friends… So, big shanks of meat, copious sides and a multitude of desserts are the norm. But not this holiday. This year, our family is scattering — leaving to visit other family and friends. When I did an actual head count of who would be with us, I realized that our numbers were cut by half. And most of the ones who will be here have bird-like appetites. Clearly, the giant buffet table won’t be necessary. Taking into account our diminished numbers, this Christmas we’ll scale back on the volume of food, but not the flavors with this very festive Cherry Apple Stuffed Pork Loin. This holiday roast was inspired by a care package of Stubb’s rubs and marinades I received a few weeks ago. Stubb’s Bar-B-Q sauces, marinades and rubs are made with quality, gluten-free ingredients and contain no high fructose corn syrup and I always have a few bottles on hand. For this pork, I used Stubb’s Pork Rub, which adds a tangy kick of spices, chile peppers and lime juice and Stubb’s Pork Marinade, a blend of chiles, lime and ginger – ba-da-bing! This tender, juicy pork loin combined with a fruit filled stuffing and heavenly apple cider gravy is a holiday meal that’s bold, flavorful with a cheery nod to Christmas. Start your prep the day before by slicing a “+” shaped opening through the center of the pork and marinate the meat with the Pork Marinade overnight. Remove the crusts from the bread and cut it into cubes. I leave it out uncovered overnight – to get stale, (but if you have critters – you might want to stick it in a cold oven or microwave overnight to protect it from sly nibblers) The next day, assemble the stuffing and gravy. Speaking of stuffing, this one starts with apples, celery and onions, like most recipes, but I also used some Stubb’s Pork Rub in it as well. It gave it a spiced, smokiness and a gorgeous golden color. Dried cherries add sweet pops of concentrated goodness to the mix. If you don’t have cherries, dried cranberries would work well too. This makes enough stuffing for the pork and for a separate casserole to bake on the side. Just dot the casserole with a few knobs of butter before you put it into the oven. As the meat roasts, the whole house will be filled with the most luscious aromas! Don’t worry if the stuffing starts to expand inside the pork, — some might ooze out the sides — but no matter. When you slice this, every piece will have its own little nuggets of fruit studded dressing. It’s very holiday-ish and perfect for a smaller crowd, especially with the cider spiked gravy! If you’re looking for more Stubb’s inspiration, try their Green Beans and Pecan Vinaigrette. Marinated pork loin roast, stuffed with a savory sweet filling of dried cherries and tart apples and a heavenly cider gravy! With your non-dominant hand, hold the pork loin, firmly pressing the sides. 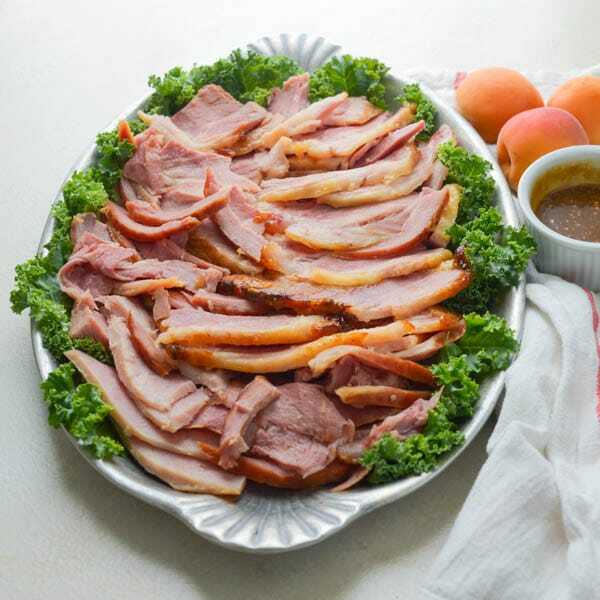 Use a long, thin and very sharp knife to make a horizontal slit through the center of the pork all the way through to the other side, gently slicing about half an inch in either direction. Remove the knife and make the same cut, in the same area -- but perpendicular to the one you've just made -- so that it looks like you've cut a "plus sign" in the center of the pork roast. Place the roast in a plastic storage bag and pour the Stubb's Pork Marinade over. Seal the bag, releasing any excess air and work the marinade all around and inside the pork with your hands. Place the bag in a bowl (to catch any spills or drips) and refrigerate overnight. Remove the crusts from the bread and cut into 1/2" dice. Place the bread in a bowl on the counter and let sit overnight uncovered to dry out even more and get stale. (You'll need about 5 cups of bread cubes). The next day, preheat the oven to 325°. In a large skillet, heat the olive oil over medium high heat. Add the onions, celery and apple and saute for 3-5 minutes until tender. Add the Stubb's Pork Seasoning, salt and pepper and stir to combine. Add the cherries and dried bread. Pour the broth over the bread and mix well, but don't break apart the bread. If it's a little dry, add a few more tablespoons of broth. Set aside to cool for a few minutes. Remove the pork from the marinade and pat dry with paper towels. Use your clean hands to stuff the pork loin with the stuffing, pressing lightly with your fingers until you reach the center of the pork. Flip the pork over and add stuffing from the other side, until the pork loin is completely filled. Sprinkle the pork with Pork Spice Rub, salt and pepper. In a small bowl, toss the onions and apple with olive oil and spread out in the bottom of a roasting pan. Place the pork loin on top and roast for one hour. There will be leftover stuffing, so spray a baking dish that with vegetable spray and transfer the remaining stuffing to the dish. Dot with a tablespoon of butter, cut into small pieces. 20 minutes before the pork is finished, add the stuffing to the oven and continue cooking. In a small saucepan add the chicken broth and apple cider and bring to a boil. Cook until the liquid has reduced to about 1 1/3 cups. In another saucepan, over medium high heat, melt the butter and add the flour, whisking to combine. Cook for one minute and stir in the thyme and Calvados, cook for another minute and then stir in the reduced stock-cider. Whisk while cooking until the liquid comes to a boil and thickens slightly. Stir in the cream, salt and pepper to taste. Remove from heat and transfer to a gravy boat. Slice the pork into 1/3" thick slices with the gravy and stuffing. Okay first off, these photos are ah-mazing! Secondly, the pork looks delicious! What a lovely recipe! I’m glad you like it Kristine – pix too! This sounds delicious! My husband and daughter would love this, pork loin is a favorite of theirs. It’s a fave here too, Emily! You always have the best recipes! 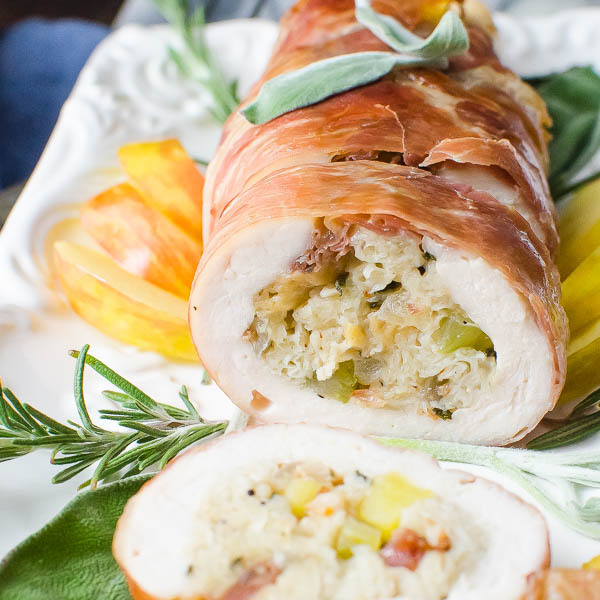 The stuffing on this sounds so good… can’t wait to make if for a special sunday family dinner! Thanks so much, I think this would be a great Sunday dinner for the family! This looks beautiful! What a perfect roast to serve to company (or for Sunday dinner at home). I love the addition of dried cherries. Cherries are one of my weaknesses and when I have the opportunity, I use them! All things good in your stuffing for the pork. Calvados really puts the extra spin on the flavor. Beautifully done, as always. The pork looks as tho it would melt in ones mouth! 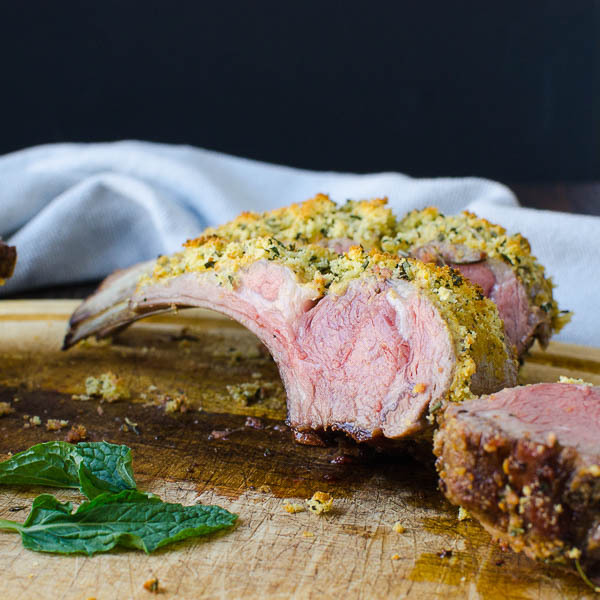 Wow – such a gorgeous roasted pork loin! I’m loving that Stubb’s Bar-B-Q sauces, marinades and rubs are GF – I need to keep my eyes open for them for sure! I like Stubb’s because they’re made with ingredients I can pronounce! What a beautiful dish! I need to check out that marinade! Looks like it can really elevate my dishes! I only ever cook for 2 of us at home, but I love doing pork loins because I always get loads of leftovers! There’s a lot of ingredients into your marinade and stuffing, but I bet it tastes beyond amazing. Definitely going to try! Everyone enjoyed this roast — and to me, why bother making stuffing if it doesn’t have good stuff in it, right?! Oh WOW This looks yummy and festive at the same time! I’m going to have to try these marinades myself! Stubb’s has a great line of products, I’ve never been disappointed! Firstly, you take incredible pictures… I’m over here salivating just at the pictures. This looks amazing! Definitely going to have to try this. That’s so nice of you Alexa! I’m glad you like them — the roast is pretty good too!